Comfrey ointment is an essential part of phytotherapy and folk medicine, whether it is implemented completely independently or as a supplement to many medicinal teas and tinctures, and is mainly used externally. The herb comfrey has innumerable medicinal properties and is particularly effective in problems with fractures of bones, but also in numerous other health problems. In our text learn how to make a comfrey ointment without preservatives and artificial additives, therefore and how can it be used. Here we go. At the very beginning one note, for medicinal purposes use the leaves of comfrey and its precious root, which is best collected in the spring or late fall. When you excavate it, it is necessary to wash it thoroughly, also to maintain all of its healing properties and precious juice, it is recommended that you first dry it, then cut it into small pieces, and allow it to dry in the warm place. The leaves should be dry in a favourable shadowy place. Domestic ointment of comfrey is mostly applied and used to lubricate the affected joints - with knee arthritis, rheumatic pain, muscle injuries, cuts and wounds, insect bites, burns, painful and inflamed haemorrhoids, varicose veins, arthritis, or for cosmetic purposes - for example: comfrey ointment for face, anti-wrinkle, firming, etc. The recipe for ointment from comfrey like most other folk recipes of medicinal herbs, remained the same as it was a few hundreds of years ago, but certain ingredients get a replacement (for example, the starting base for many preparations was lard, and people who do not want to use it can use vegetable fat). In addition, many add beeswax, which provides strength, and other medicinal herbs of pleasant scent, and a few drops of essential oils. Vegetable fats and oils have a beneficial effect in the case of joint and bone diseases, muscle aches, sprains, dislocations, haemorrhoids and many skin diseases – that is why comfrey ointment is especially recommended. Some recipes are used in the cases of respiratory diseases, as a compressor or for massage. Before embarking on the creation of ointment from comfrey, you need to know how to wash the fat, because lard is the base of most products, it is necessary to prepare it adequately. Unsalted fat is placed in a bowl, pour lukewarm water, puree soup, and then pour the excess fluid. Phytotherapists advise that grease be washed at least 5 times or more than 9 to remove any dirt. Otherwise, "washed in nine water" represents the old, proven and effective drug against various gynaecological diseases and you can use it freely and vaginally, first as a prevention, and to treat a variety of infections. Washed lard heat well, add the herbs, slowly mix in the light temperature and when it starts to foam, immediately remove from the heat and slowly stir for some time. Now all cover and leave to rest for 24 hours. After that gently heat the mixture with constant stirring. When the mixture becomes more fluid, strain it, leave it to cool and pour it in dry and clean glass jars. If desired, you can add up to 15 drops of essential oil of lavender and rosemary. Leave the ointment of comfrey to cool and store it in the fridge. This is also one of the best herbal ointments against rheumatism and sciatica. Also, it is very effective against inflamed haemorrhoids. If you have problems with your knees, this comfrey ointment is easy to apply on the painful area, which can then be wrapped with plastic wrap or wrapped in a scarf. You will need root of comfrey and lard in equal proportions. Root needs to be washed thoroughly and dried and chopped as tiny as possible. When the fat starts to boil, pour chopped comfrey root into it and fry for about five or six minutes. Remove everything from the heat and let it rest and cool down for a whole day. The following day re-heat it, and strain it through cheesecloth, then pour into a glass container and keep in fridge. Congratulations, you have successfully created comfrey ointment for wrinkles. 25 grams of a quality beeswax. In the bowl pour cold water, and it therefore deliver finely chopped comfrey, and so that it completely covers the water and let them sit for 12 hours. In other metal pan, melt beeswax and add a decilitre of olive oil. Remove from the stove-top and pour the mixture into another bowl (preferably porcelain) and then add comfrey. Gently stir with a wooden ladle until ingredients are finely merged into a harmonious homogenous mixture. Cover the bowl and let it stand for the next six hours. Again re-heat it and then filter and pour into glass jars. 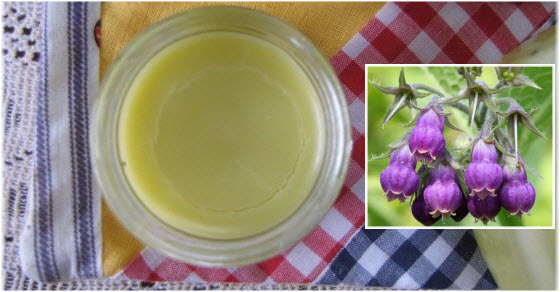 Comfrey ointment with beeswax also needs to be kept in a cool place - best in the fridge. IMPORTANT NOTE: To create ointments and creams mostly dried plants are used because fresh contain water, which can encourage the development of mould and bacteria. Although this problem can be solved by adding natural preservatives and storage products in the refrigerator, it is better not to risk that. Fresh herbs should be dried carefully, and then chopped finely in order for oil or grease to tie to itself the maximum number of plant cells. Proceed according to this recommendation if you are planning to make a healing ointment of comfrey. WHERE TO BUY COMFREY OINTMENT? Today it can be found in herbal pharmacies and better equipped health food stores, as well as online shops. Before you buy over the Internet, inform yourself about the product. Note: Comfrey ointment during pregnancy is not recommended.